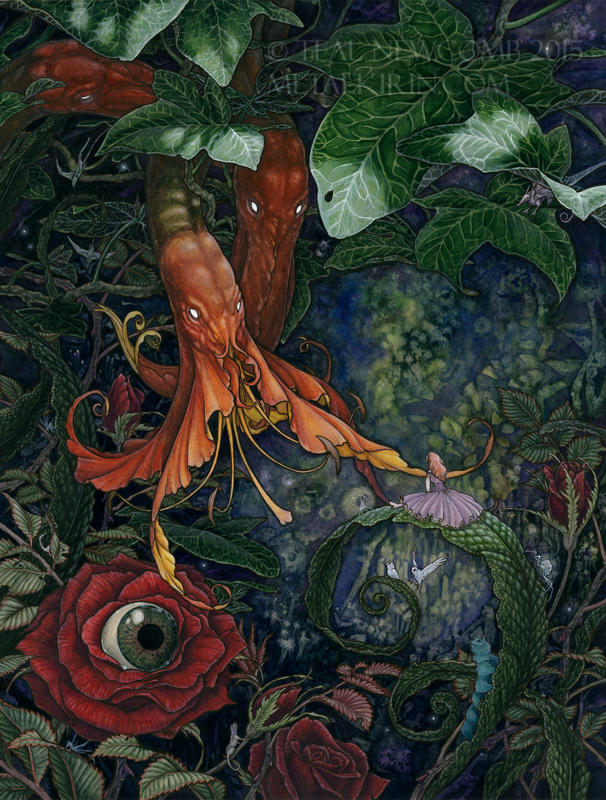 Limited edition Fine art giclees of "Alice and the Flowers" and other paintings by fantasy artist Teal Newcomb. 29 backers pledged $1,069 to help bring this project to life. 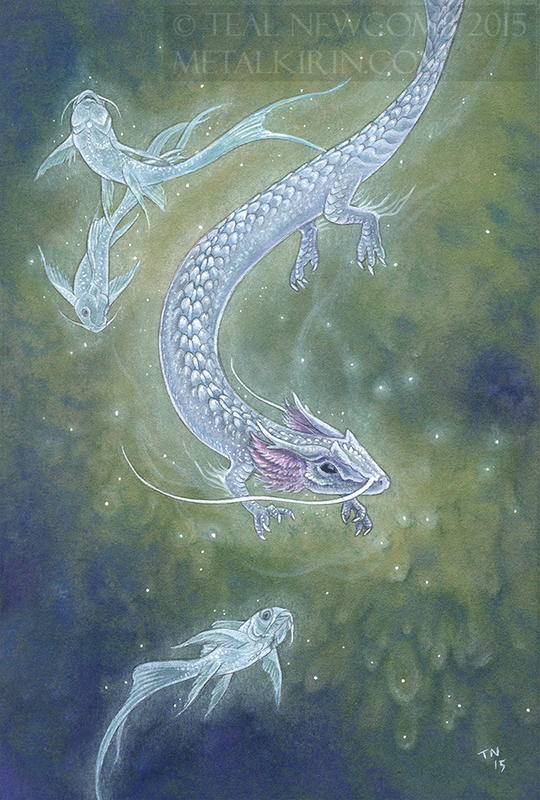 I'm Teal Newcomb, a watercolor artist from Michigan. I have always been inspired by folklore, fantasy, and nature, especially being lucky enough to grow up surrounded by the beautiful forests and waters of northern Michigan. As a small child I loved to draw, as most children do, but I never grew out of it. 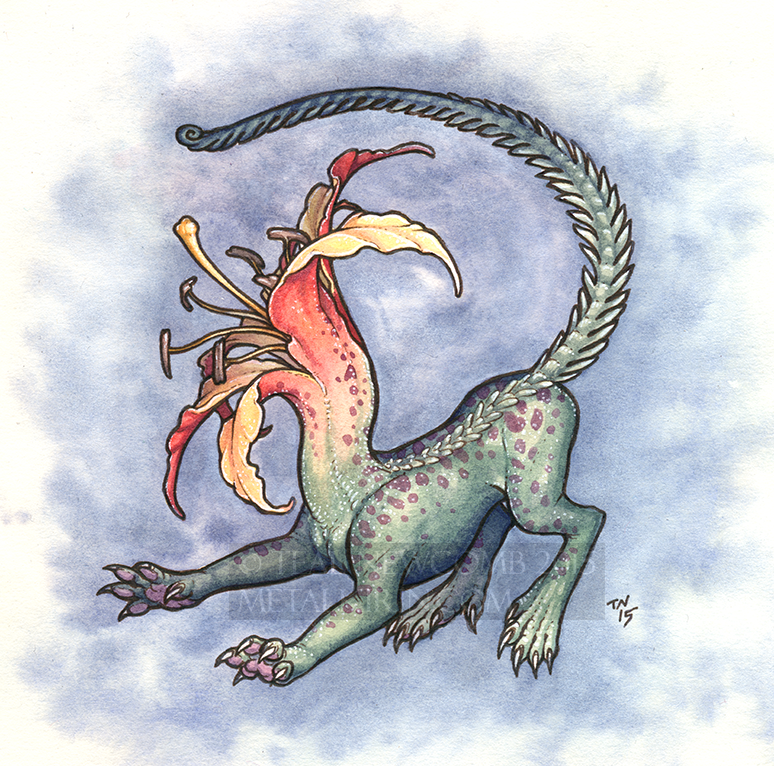 I've continued through the years to put as much time and effort as possible into improving my art skills, and putting the creatures and worlds in my head to paper so I can share them with those who appreciate the surreal and the fantastic. I want to offer the best quality art reproductions possible. For the last few years I have been offering high quality lustre and metallic prints, and I will continue to do so, but I wanted something even better. A print that not only comes closer to capturing every minute detail of my intricate original paintings, but actually allows for printing a larger reproduction than the original without sacrificing image quality and detail clarity. This project's been on my mind for a while. I wanted to kick it off with something I was really proud of, so I began working on a new piece, larger than my usual and more detailed than anything I have attempted to date. "Alice and the Flowers" was inspired by one of my favorite fantasy stories from my childhood, and measures 9"x12" and took over 40 hours to complete. "Alice and the Flowers" Click to view a larger image! Not all Giclée prints are created equal. The term is often used to describe high quality archival inkjet prints, but as it is an unregulated term, Giclée prints can vary significantly in quality and longevity. These prints are hands down the best quality I have been able to get my hands on, after reviewing a variety of test prints. Featuring beautifully crisp details and vibrant colors on a lightly textured velvet surface, they offer the look and feel of original watercolor paintings at a fraction of the price. They are made with professional quality archival inks on 100% cotton rag paper with an acid free buffered base to ensure a beautiful long lasting image. Here's a close up of a test print of "Desert Flower". Of course a photo doesn't do these beautiful prints justice, but it gives some sense of the amazing detail and quality. I want to keep these prints as affordable as possible, and printing in batches keeps the per print cost down, so I am hoping to raise enough for a small run of 9"x12" Fine Art Giclée prints, plus a little extra for the other rewards. This won't pay for the entire edition, which would be cost prohibitive to print all at once, just enough for a bulk price break. I am hoping to stick to a pattern of making most of my pieces available as both limited edition fine art Giclées and smaller open edition non Giclée lustre prints, so "Alice and the Flowers" is also available as an open edition 8"x10" lustre print. While the lustre prints are professional quality and a good value, they really don't come close to matching the beautiful print quality of the Giclées. If we can hit some stretch goals, I will be able to make more of my pieces available as affordable fine art prints, and print up some fun bonus printed items like bookmarks and stickers, which will be available as backer bonus rewards and add ons! A backers-only poll will be used to choose the new prints as they are made available. "Astral Drift" Limited edition metallic mini print: Full bleed (this means the image is printed to the edges of the paper) on 4"x6" metallic paper, limited edition, signed and numbered on the back. This is a Kickstarter exclusive print, I will reserve some for future projects, but it will not be available outside of Kickstarter. In the event stretch goal #4 is reached and limited edition 5"x7" Fine art giclees of "Astral Drift" are unlocked as an add on, it will not be a KS exclusive print, but backers will have access to them at a special add on price, and the first chance at snagging one before the edition runs out. Edition size(s) will be determined once the project ends. I will not be making open edition lustre prints or postcards of this piece. "Astral Drift" Click to view a larger image! Open edition lustre print "Flowerhead" Full bleed 5"x5" print, open edition on lustre paper, will fit a standard 5"x5" frame. "Flowerhead" Click to view a larger image! Open edition lustre print "Alice and the Flowers" 8"x10" image on 8.5"x11" lustre paper will fit a standard mat opening. These don't come as close to replicating the original painting as the giclees do, and the image is cropped a bit, but they're still professional quality, and a very nice print for this price range. 9"x12" Fine art giclee prints: 9"x12" image on 11"x14" paper, they will fit a 9"x12" standard mat opening, or can be displayed as is in an 11"x14" frame. These prints are absolutely beautiful and feature unmatched color clarity and details, they look like original watercolor paintings! Archival inks on acid free, lightly texture velvet paper, they will last a life time under proper care. "Alice and the Flowers" will be the only fine art print available unless stretch goals are reached, but many more can be unlocked if stretch goals are hit! UPDATE! We are close enough to stretch goal #1 that I am unlocking "Desert Flower" as a giclee print option! 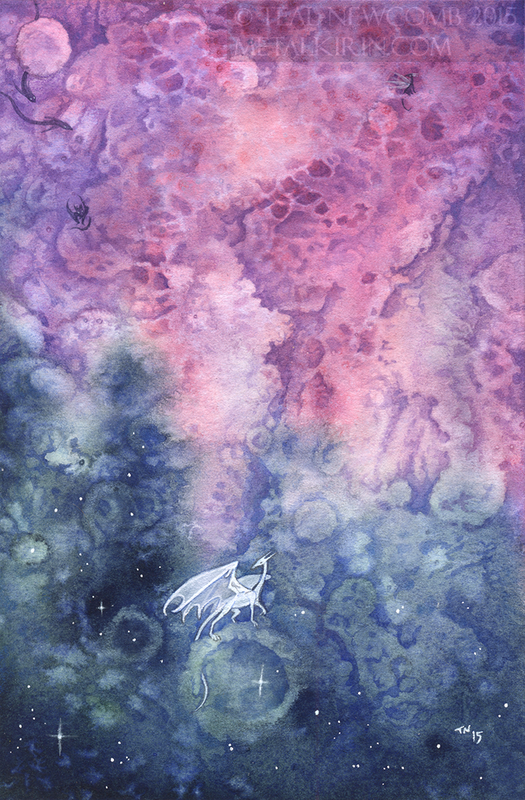 "Astral Drift" Original watercolor painting: 4"x6" watercolor and acrylic painting, Includes archival matting in black to fit a standard 8"x10" frame. "Flowerhead" Original watercolor painting: 5"x5" watercolor painting, Includes archival matting in black to fit a standard 8"x8" square frame. 4 new bookmark designs. Like the postcards, they feature beautiful print quality on a nice thick cardstock. Actual bookmarks will not be watermarked. Postcards: Set of 13: $14. One card of your choice: $2. Beautiful print quality, 4"x6" glossy postcards on thick cardstock. 13 different images, click HERE to see the full set. More images will be added if stretch goals are hit! More open edition lustre prints! Any of the prints seen here can be added to your pledge (yes, even the sold out ones)! 8"x10" prints are $11 each, 5"x7" and 4"x6" prints are $8 each. 9"x12" Fine Art Print: Backers pledging at the Reticulated Iris or Violet levels or above may add extra 9"x12" fine art prints for $30 each. This is a pretty low risk project. I have reviewed test prints and made multiple orders through the print company I will be working with, and have always been very happy with the print quality and turnover time, so I expect no complications on that front. The main challenge will be to complete the original art rewards in a timely manner, but I have limited the number of commissioned pieces I will be doing, and I currently have a lot of time to devote to art creation, so I am confident it will not be an issue. December is listed as the delivery date in case of any delays, but I will likely get the rewards out by September. 5"x7" and 8"x10" painted commissions have a later completion date than other rewards, however I will likely finish and ship most, if not all of them with the rest of the rewards. ~ All backers pledging any amount will have the ability to vote on which images will be made available as fine art prints as stretch goals are met! 8"x10" open edition lustre print tier! ~One 8"x10" open edition lustre print of "Alice and the Flowers"
*Reticulated Iris* Early bird special! ~ My original painting "Flowerhead"
~ My original painting "Astral Drift"